Pan-Asian food has to be one of my favorites. I seriously could eat it every day in some form. 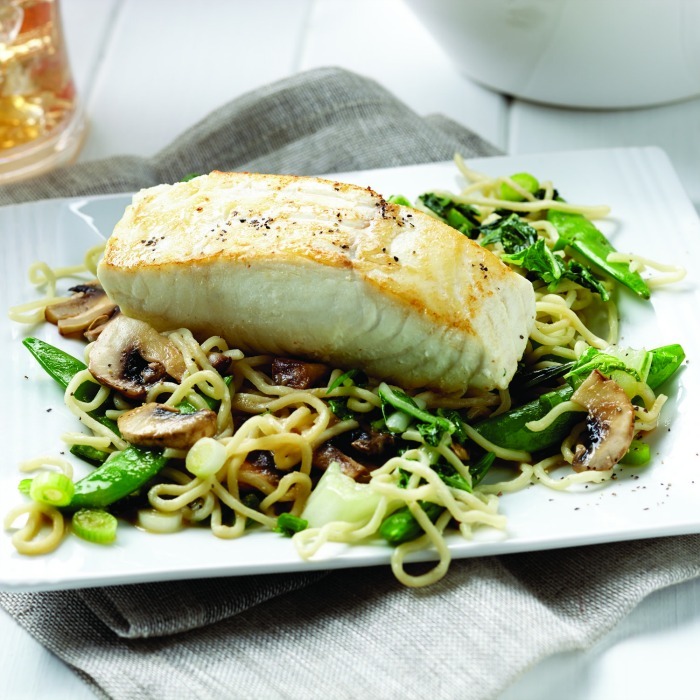 And this miso halibut dish with soba noodle stir-fry fits that bill! If you’re thinking about eating healthier, Alaskan fish not only delivers great-tasting nutrition, but also provides one-of-a-kind health benefits. In fact, the combination of lean protein, anti-inflammatory omega-3s and muscle-building nutrients found in Alaska seafood are why it’s a staple for many athletes. But for us regular folks, it provides a low-fat meal with protein and simple-to-digest carbs. If frozen, rinse ice glaze from halibut under cold water; pat dry with paper towel. Heat large, nonstick skillet or wok over medium-high heat. Brush both sides of halibut with half of the sesame oil. Shake pan occasionally to keep fish from sticking. Turn halibut over; reduce heat to medium and cover. 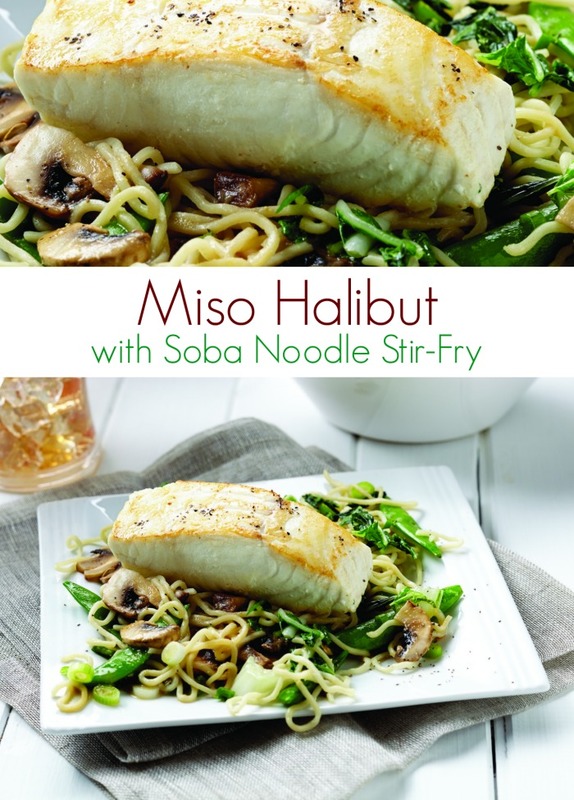 Cook 5-7 minutes for frozen halibut or 2-3 minutes for fresh/thawed fish, cooking until fish is opaque throughout. Transfer fillets to plate; cover to keep warm. Wipe out skillet/wok with paper towel. Add remaining sesame oil. Heat to medium-high then add and stir-fry bok choy, snap peas, mushrooms and green onions. Stir in noodles; turn off heat. Cover and keep warm. In saucepan, blend miso, water and teriyaki sauce. Bring mixture to boil then reduce heat to a simmer and cook 1 minute. Stir sauce into warm noodle-vegetable mixture. To serve, divide and portion mixture into 4 bowls or plates. Top each with halibut fillet. Find more healthy recipes right here on The Jenny Evolution! Add some Pan-Asian flare to your fish tonight!